What should Australia's post 2020 #climate targets be? 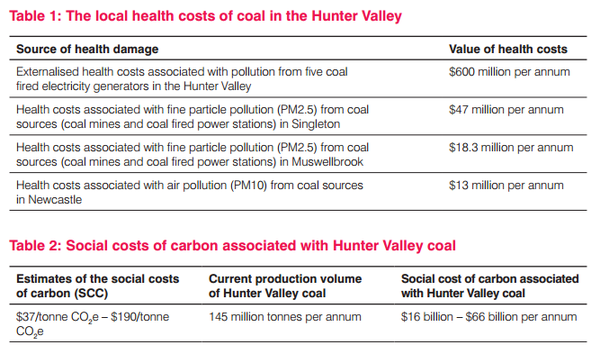 A report just released by Environment Victoria found that the social and health costs of coal in Victoria amounted to about $3.7 billion each year. Tom Arup and Adam Morton at the Age report on The hidden cost of the Hazelwood coal power plant. There is so much in cost being born by the taxpayer, while companies like GDF Suez, Energy Australia and AGL Energy rake in the profits, yet we can't manage to close a redundant, dirty, aging coal plant like Hazelwood. To stave off transitional changes Abbott has endeavoured, and succeeded, in undermining Australia's renewable energy sector that has seen a plunge in investment to near zero and loss of jobs, just as the rest of the world expands renewables production faster than 'expert' growth predictions. The USA - China climate deal has meant China is already acting to cap usage of coal, both to address the huge pollution problems and the social unrest that has been engendered, and the carbon pollution threat to increasing world temperatures. This is not good news for Australia's expanding coal export industry. 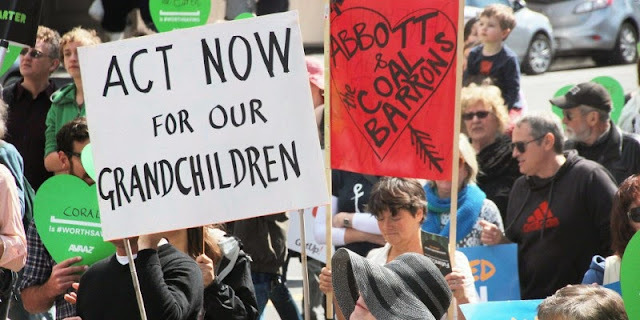 The Baird NSW State Government approved 1.366 tonnes of new coal mines in the six months before the NSW election. It is doubtful if they will all go ahead, and those that do will be at risk of becoming stranded assets due to the structural changes in coal demand due to climate change and it's health impacts. 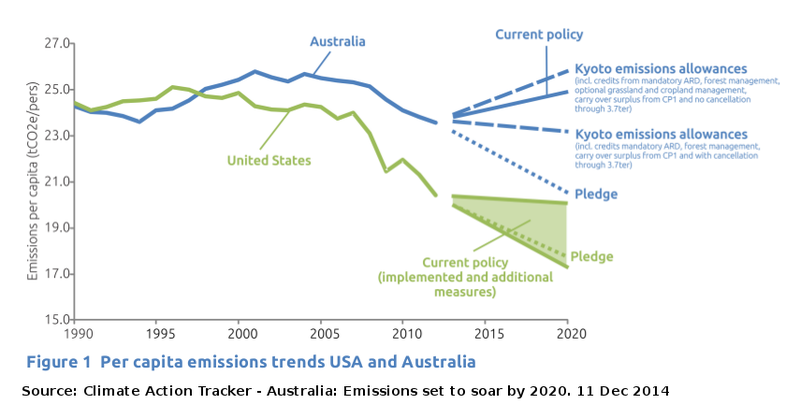 Australia's current emissions reduction target is 5 per cent on 2000 levels by 2020, although we still have a commitment under the UNFCCC to a range up to 25 per cent if certain conditions are met. Other Nations have already lodged questions about Australia's low ambitions and how it will meet it's commitments through the United Nations Framework Convention on Climate change (UNFCCC) process. Brazil asked "Considering the low level of ambition presented until now, as well as the historical data, does Australia intend to change its unconditional target in order to increase its level of ambition?" China asked "Clean Energy Future Plan set out a number of PaMs to achieve the 5% emission reduction target in 2020. However, ETS and CFI, as two core elements of this plan, have been replaced by the Emission Reduction Fund (ERF). What is the expected mitigation potential of this fund? Will it be enough to compensate for what was included in ETS and CFI?" Switzerland asked "To what extent are renewable energy sources (RES) being used by the Party at present and how is the potential for replacing conventional fuels for power generation by RES estimated for 2020 and beyond? What share of RES in total national power generation is expected to be achievable by 2020 and 2030, respectively?" Foreign Affairs Minister Julie Bishop has resolutely stuck to this low level of ambition at the Climate summit in New York in September, 2014 where she was shunned. More recently she evaded a question on climate change and the risk to security when she attended Obama's 6th State of the Union (SOTU) Speech in January 2015. I remember that during the 2007 Kyoto Protocal climate talks where the Bali roadmap was formulated, the recommended emission cuts were moved to a footnote. I wrote at the time: "The guideline that rich countries should cut emissions by 25-40 per cent below 1990 levels by 2020 as recommended by the International Panel on Climate Change (IPCC) was moved to a footnote at the US delegation's insistence." Already the USA has submitted it's negotiating targets and Obama has stated that climate change can no longer be denied or ignored. The United States commitment is for "an economy-wide target of reducing its greenhouse gas emissions by 26-28 per cent below its 2005 level in 2025 and to make best efforts to reduce its emissions by 28%." France has urged Australia to stick to its climate commitment. French ambassador Christophe Lecourtier told ABC AM program "Your country is a very influential country in the Asia-Pacific region and you know that climate change is having tremendous consequences in the region....We do believe that it's the ultimate ambition for the world community if we want to leave a liveable planet for the next generation. And I do expect your country, as my government expects your country, to be one of the key countries, one of the leaders in that very important moment at the end of this year." Julie Bishop, also on the ABC AM radio program, said that Australia would play a positive role in the talks, "Australia contributes about 1 per cent of global greenhouse gas emissions and so we will take action that is proportionate to our global greenhouse gas emissions." It is likely the Abbott Government will attempt to use the work of Lomborg's consensus centre to down play the necessity to mitigate climate change and to argue that Australia should have special consideration due to our heavy reliance on coal for electricity generation. Australia had a special consideration clause - it was even called the Australia clause - under the Kyoto Protocol, over land use and deforrestation emissions which made it much easier for us to meet our commitments. This time round we might find other nations won't be so generous to allow any 'special consideration'.